Known for their premium collectibles and many exclusive athletes, Steiner Sports has combined the two for their new "In Their Own Words" line of display pieces. The unique items feature historic moments in sports that are taken directly from the athletes themselves as a first-hand account and presented as signed story pages. 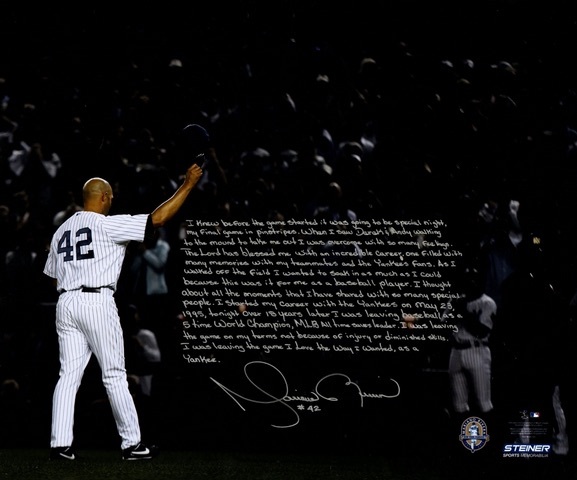 These exclusive hand-written stories are also available as metallic photo prints and stretched canvases and include prominent players like Mariano Rivera. 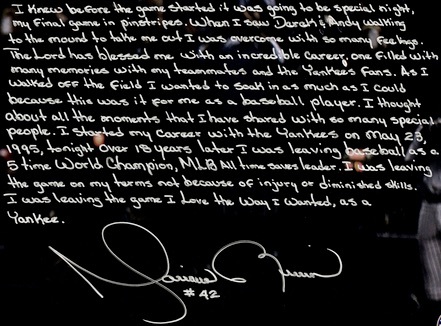 Collectors have already been exposed to inscription autographs on both cards and other memorabilia, but this takes things to the next level and allows for a more personal connection to the player and the particular moment depicted on the piece. The collection already includes over 50 athletes and more are on the way for a total of over 100 players and 200 stories. Several of the subjects have multiple options that each cover a different moment from their playing career. It is important to note that the stretched canvas and metallic photo prints are facsimiles of the original story page. While they are not currently available for everyone, all of the players also have limited, hand-signed versions. View the full lineup of available athletes below. 1973-74 Topps BOB LANIER Autograph Hall Of Fame Inscription Auto !! 2018 Bowman Chrome Shane Bieber Prime Chrome Auto #d 31 50 INSCRIPTION!